SAN FRANCISCO (Reuters) – Microsoft Corp is rolling out upgrades to its sales software that integrates data from LinkedIn, an initiative that Microsoft CEO Satya Nadella said was central to the company's long-term strategy for building specialized business software. 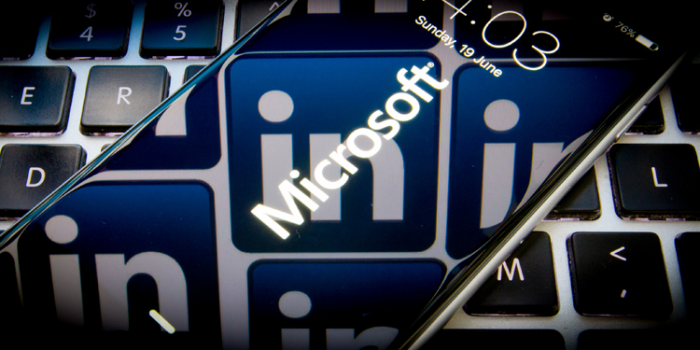 The improvements to Dynamics 365, as Microsoft's sales software is called, are a challenge to market leader Salesforce.com and represent the first major product initiative to spring from Microsoft's $26 billion acquisition of LinkedIn, the business-focused social network. The new features will comb through a salesperson's email, calendar and LinkedIn relationships to help gauge how warm their relationship is with a potential customer. The system will recommend ways to save an at-risk deal, like calling in a co-worker who is connected to the potential customer on LinkedIn. The artificial intelligence capabilities of the software would be central, Nadella said. "I want to be able to democratize AI so that any customer using these products is able to, in fact, take their own data and load it into AI for themselves," he said. While Microsoft is a behemoth in the market for operating systems and productivity software like Office, it is a small player in sales software. The company ranks fourth – far behind Salesforce.com and other rivals Oracle and SAP – with just 4.3 percent of the market in 2015, the most recent year for which figures are available, according to research firm Gartner. Salesforce declined to comment on Microsoft's competing software. But Nadella said specialized applications in fields like sales and finance are critical to the company's future. He bills them as Microsoft's "third cloud," the first two being Office 365 for general productivity like email and Azure for computing and databases. Nadella's bigger vision is to have all products take advantage of a common set of business data that can be mined for new insights with artificial intelligence. "I think that's the only way to long-term change this game, because if all we did was replace somebody else's (sales), or (finance) application, that's of no value, quite frankly," he said. Microsoft pointed to Visa as a success story. Earlier this year Visa was in the process of choosing a cloud-based customer service software system and picked Microsoft's over Salesforce. Rajat Taneja, executive vice president of technology at Visa, said Nadella's three-cloud strategy was the deciding factor. That compares with Salesforce revenue of $8.3 billion overall and $3 billion for its sales software specifically. Dynamics also grew more slowly than Salesforce last year – Dynamics revenue grew just 4 percent versus 26 percent for Salesforce, which is also rolling out artificial intelligence features. Nadella is under pressure to show that the pricey LinkedIn acquisition in mid-2016 was worthwhile. R "Ray" Wang, founder of analyst firm Constellation Research, said LinkedIn-powered features, combined with popular programs like Office and Skype, could help. "Microsoft is putting together the contextual business data people need to be more efficient and build better relationships," Wang said. "That ecosystem approach is something that we will absolutely maintain and, in fact, if anything keep continuing to evangelize," Nadella said.